Notice how when the player is moving into the wall, the event fires every frame, but when the player holds still, the event doesn't fire. The capsule is clearly touching the wall, but that doesn't seem to register as a hit. How can I get the event to fire every frame they touch? You could try casting first to see what you are colliding with and setting a bool variable "Colliding" to true on OverlapBegin instead of hit and false on OverlapEnd. Then use a tick event to do whatever. Not sure if that's the best way but it is a way. 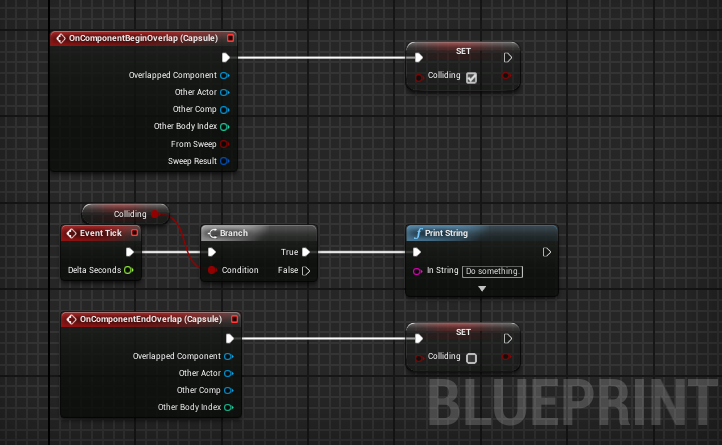 When I was using the "hit event" it worked perfectly fine, but now with the "overlap event" it doesn't work at all! All the values return zero! How can we create a working fire extinguisher? Event hit happens only once? why?